A commercial range hood is an important part of any commercial kitchen. National fire code (NRC) regulations will evaluate your compliance with regulations applying to fire safety before you open, and choosing the right commercial range hood, and all that is involved, will be part of the process. Some regions have more than one agency dictating fire code regulations, so make sure that you are well acquainted with the regulations in your area before purchasing your commercial range hood. When purchasing a commercial range hood you will need to consider the: size of the hood, type of hood, type of exhaust fan type (either a supply air fan or a makeup air fan), and the type of fire suppression system. National Fire Codes (NRC) will dictate exactly how much larger your range hood should be than the cooking area it covers, The NRC requires that you have a six inch (2.4cm) overhang on all sides of your commercial range hood; but you may find that your local Building Codes require more space, so you will need to have all this information on hand before you make your calculations. The type and size of hood fans and fire suppression systems may also be under fire code specification, with some regions requiring that you have only a licensed contractor perform any installation. Most commercial kitchens can function with one commercial range hood to take care of its main cooking area, with that area containing a range, broiler, griddle, and gas fryer. Placing this cooking equipment together will eliminate the need for more than one commercial range hood. Depending on your menu, you may also need a grease hood to filter grease vapors during food preparation. If you only need to cover a steamer, pizza oven, dishwasher or other similar equipment that doesn’t produce grease vapor, a condensation hood or heat hood will suffice. You will need to attach an exhaust fan to your commercial range hood in order to draw air and fumes up and out of the building. The speed and size of the exhaust fan will be determined by the size and type of your commercial range hood; the equipment under the hood; and the location of you kitchen’s cooking area. Whether the cooking area is located in the center of the kitchen or up against a wall will make a difference in the speed and size of the exhaust fan. Some areas of the country require food establishments to have fans that will also put air back into your kitchen, either a supply air fan or a makeup air fan. But, even they aren't required by law, it is still a good idea to install them in order to balance air pressure in your work area. Another worthwhile installation is a fire suppression system as a precaution to a stove fire in your commercial kitchen.Air fans and fire suppression systems, while not always required in commercial kitchens are great safety features to consider for the safety of your employees as well as for your equipment. 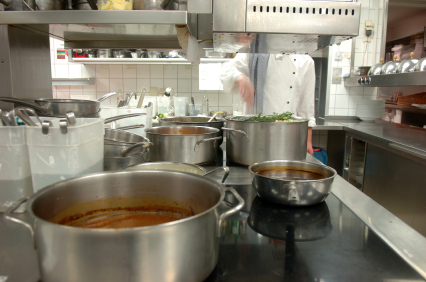 Purchasing a commercial range hood is best done via your food service equipment vendor. Any reputable, local commercial range hood dealer will have all the information you will need not only to purchase the correct range hood that meets the code specifications of your area, but they should also be able to evaluate what type and size of commercial range hood you will need. Commercial range hood manufacturers are required to make specification sheets available to customers; and most of these specs can be found online, helping you make the most informed decisions you can.